The sweet spices in baharat were made for autumn stew. 1. Heat 1 tbsp. oil in a 5- to 6-qt. pan over high heat. Sprinkle lamb with 3/4 tsp. salt and 1/4 tsp. pepper, then brown in oil, stirring occasionally, 6 to 8 minutes. Transfer lamb to a bowl and reduce heat under pan to medium-high. 2. Add shallots, 1 tbsp. oil, and 1/4 cup broth to pan; stir to loosen browned bits. Cook, stirring occasionally, until shallots are browned, 7 to 10 minutes; add a splash of water if drippings start to get dark. Return meat to pan and sprinkle with baharat. Add 2 more cups broth, stirring to loosen browned bits. Cover, bring to a boil, then reduce heat and simmer 1 hour, adding another 1/4 cup broth if pan starts to dry. Stir in rice and tomatoes and return to a boil. Meanwhile, continue with recipe. 3. Preheat oven to 375°. With a short knife, carefully cut around squash stem to make a 4-in. lid. Pry out lid with a table knife. Scrape out and discard seeds from lid and squash. Brush interior of squash and inside of lid with remaining 1 tbsp. oil, then sprinkle them with remaining 1/4 tsp. each salt and pepper, tipping squash to coat evenly. Set squash on a rimmed baking sheet. Prick with a fork in a couple of spots near the top. 4. 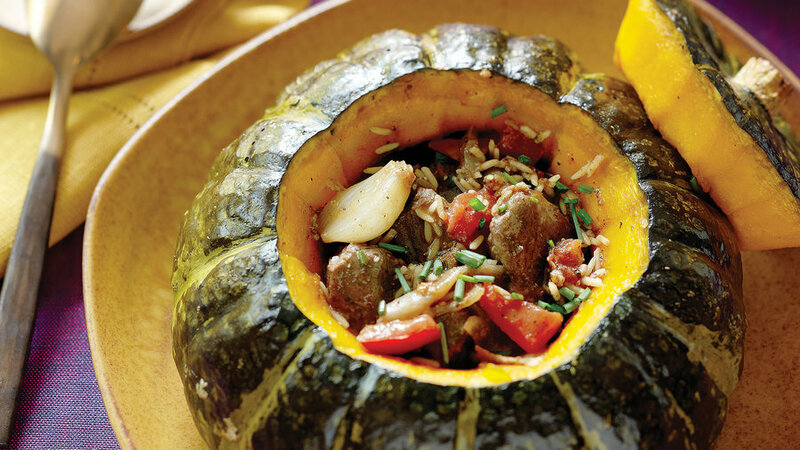 Fill squash with as much stew as fits. Set lid in place and bake until squash is just tender inside when pierced, 70 minutes to 11/2 hours. Meanwhile, spoon remaining stew into a small loaf pan, cover with foil, and bake 1 hour. 5. Stir chives into stew in pan and squash. Transfer squash to a platter with 2 wide spatulas (squash may split a little; this is okay). Use a big metal spoon to scoop out squash and stew into soup bowls, adding stew from pan. PER SERVING 326 Cal., 33% (109 cal.) from fat; 22 g protein; 12 g fat (3.1 g sat. ); 36 g carbo (4.5 g fiber); 542 mg sodium; 48 mg chol.